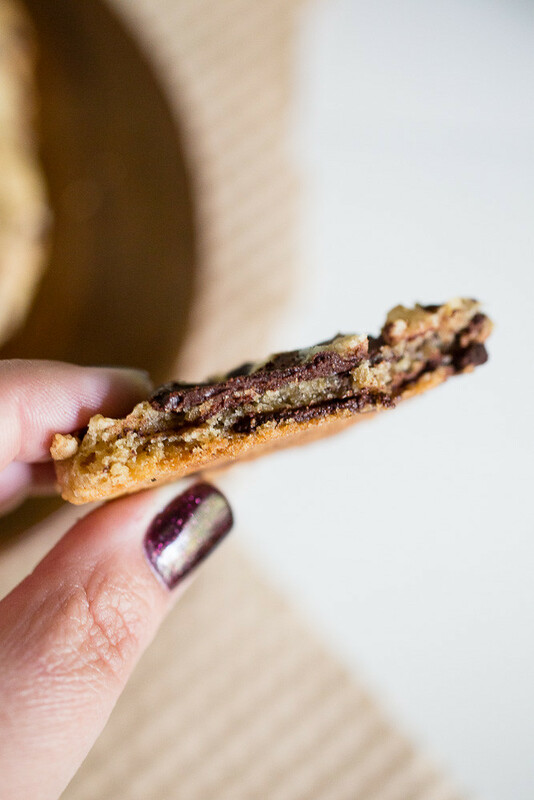 Marriage counseling cookies – With their dark chocolate layers and flaky sea salt sprinkle, these cookies have stopped ongoing arguments about what makes the best cookie in our house. 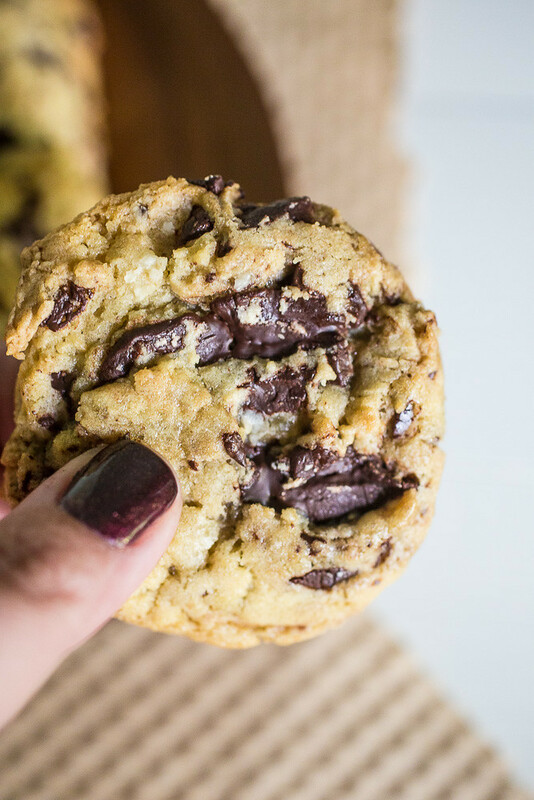 You know when you find THE PERFECT chocolate chip cookie recipe? It’s the one that upped the “good” cookie threshold to higher level of cookie stardom. The one that made you wonder what your life was like before it appeared. The one you continue to make over and over and over. And over. And then adapt into other recipes. The one that causes fights with your husband over which recipe is better (his: really basic (i.e. original yellow chocolate chip bag recipe) vs. yours: totally on fleek). Welp. These salted dark chocolate chip cookies are pretty darn close to that perfect cookie. I mean, REALLY close. It’s kind of a grown up version in that there’s dark chocolate and flaky sea salt. And to me, these two ingredients, especially when combined, always constitute grown up. 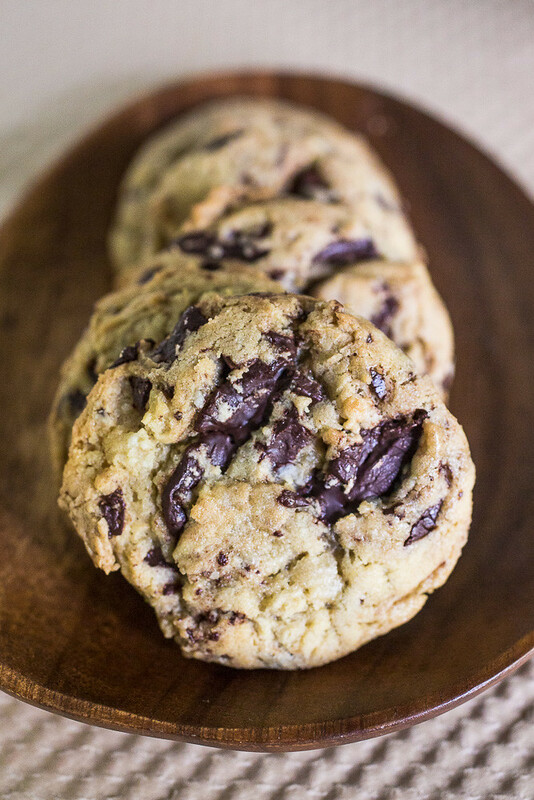 The flavors meld so well together and with layers of dark chocolate swirling throughout each cookie, a really good dark chocolate – like 72% cacao – is the right way to go. They bake up beautifully too. No ridiculous spreading, no overcooked bottoms or edges, and no 24-hour wait time (ugh!). They actually bake even better when you bake them right from the freezer. This of course, is my M.O., since we definitely don’t need two dozen plus cookies hanging around our house. And best yet, they’re a chocolate chip cookie that Kyle and I equally agree is fantastic, worthy of making many more times without arguments, in fact. Marriage counseling cookies? Yes, indeed. While these cookies don’t need a rest period in the fridge like other cookies do, they do actually bake up better straight from the freezer. So, go ahead and make yourself a batch, bake a few off, and freeze the rest of the dough in shaped dough balls on a parchment-lined baking sheet. Once frozen, you can toss the dough balls in a zip-top bag and store in the freezer until you’re ready to bake them off. So easy, right?! Preheat oven to 360° F (← not a typo). Line two baking sheets with parchment paper. Melt butter in a small saucepan over low heat and take it off the heat before it starts to bubble or sizzle. Whisk the flour, baking powder, baking soda, and salt together in a medium bowl. Pour the melted butter into a large bowl and whisk in the brown and granulated sugars. With a wooden spoon, beat in the eggs one at a time until the first is well-incorporated before adding the next. Blend in the vanilla extract. Stir the dry ingredients into the wet ingredients until barely blended. The dough will look a little shaggy and floury. Mix in the chopped chocolate, including all of the chocolate dust that remains on the cutting board. Roll the dough into balls, about 3 tablespoons each, and place them on the cookie sheets about 3 inches apart. At this point, you can bake right away, freeze the dough balls, or refrigerate the dough balls for up to one day before baking. Sprinkle the dough balls with a good pinch of flaky sea salt over the top of each. Bake for 10 to 13 minutes, rotating the pans from top to bottom and front to back halfway through the baking time, until the cookies are crackly and lightly golden brown. Transfer the pans to wire racks, cool the cookies for two minutes, and transfer the cookies directly to the racks. Sprinkle with another tiny pinch of sea salt before eating, if desired. adapted from Seven Spoons by Tara O’Brady via Apt. 2B Baking Co.
lol, I love the name! These sound awesome! bahahaa LOVE the name! and these cookies definitely look perfect, I love all that dark chocolate! lol love your reaction, Kayle! I’m salivating just looking at these. Oh. My. Word. Delicious!